While everyone knows how much I love running, many don't know my love for PGA tournaments. In my former job, we hosted LPGA and Senior tour events and golf tournaments became one of my life. Fast forward many years later, I still work with the PGA in my current job. It's my favorite event to throw over the year. So when I was contacted about The Par4Miler during the Valspar Championship, I was pretty excited. This four mile timed race is taking place on March 6th at Innisbrook Golf Resort. 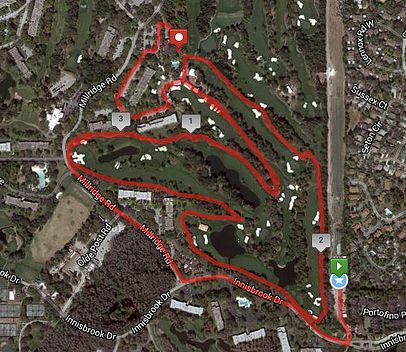 The four mile run will take place on the roads of Innisbrook and the turf of the Copperhead tournament course! If that's not cool enough, the 18th Green is the finish and there will be a Post-Race Party in the Hospitality Suites. I don't want to sound like an infomercial by saying that's not all - but that's not all!!! With your Par4Miler registration, you get a lot of fun perks! I have a giveaway for one bib so be sure to enter at the end of this post. Each race entrant will get a Grounds Badge good for admission to one Round of the Valspar Championship (Friday March 11 thru Sunday March 13; Thursday March 10 not included) --- a $39 value! Every Runner will receive a certificate for a free gallon of Valspar Premium Interior paint courtesy of Valspar --- a $31 value! Join us in the Suites around 18th Hole Finish area for a great recovery from your race with food and beverage included! 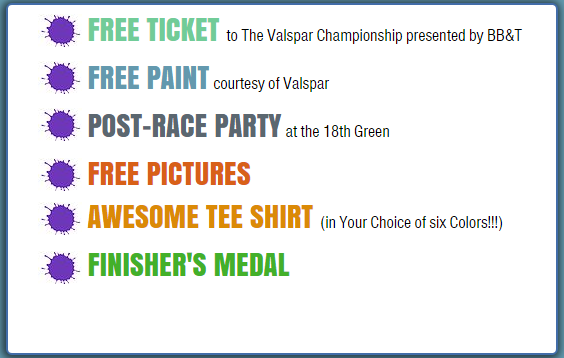 The Valspar Championship is pleased to offer FREE race pictures from your race day! You will get 3-4 pictures from various points on the course and at the 18th hole Finish Line! In true Valspar fashion, you will receive your choice of six shirt colors. You also have your choice of tech tee or fashion cotton tee! Finally, a race shirt you will want to keep! Every Finisher gets a fantastic 3--inch medal with finisher ribbon for your collection! Registration is limited to 1700 runners so sign up early! The Par4Miler at the Valspar Championship is a unique event to engage the Tampa area running community and help raise funds for various charities! Runners of all skill levels (walkers too) are invited to experience a "backstage look" at the tournament prep as they traverse the 4 mile route through the Copperhead Tournament Course. Participants will run through the famous Snake Pit and finish on the stadium-like 18th Green the night before the tournament gets underway! Click here to register today - there are only 1700 entries available for this event! I am giving away one entry to the Par4Miler at the Valspar Championship. Let me know in a comment below why you want to win this race bib - Free Paint, Free Ticket, Experience, Shirt, 3" Medal? I hope to see you there! Why do I want to win this race bib? WHY? Why on earth WOULDN'T I?! The Valspar is a great tournament with a top-notch field every year. The fan experience is always wonderful! It's close to home, I get to play hooky from work and the course is incredible--any chance you're also giving away a round at Innisbrook?! If so, PUT ME DOWN!! Oh, I also fancy myself a runner and I would love the chance run Copperhead! Was a winner ever announced??? Yes. The winner was Anthony D.